Joe Wright is pictured with John Marquis. Joe Wright says the biggest improvement at Doncaster Rovers is in game management. Fifth-placed Rovers can extend their unbeaten run in League One to six games and make it three wins on the bounce if they beat Bradford City tomorrow. Centre back Wright is among a group of young players - including Marko Marosi, Niall Mason and Ben Whiteman - to have the started the new season in excellent form. 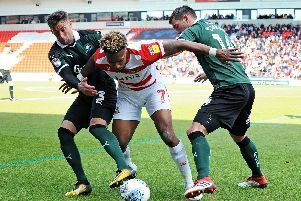 And the 23-year-old says that, while finishing 15th place might have been disappointing, last season was crucial to the development of this Rovers team. “I’d say game management is where we’ve improved the most,” said Wright ahead of this weekend’s Yorkshire derby. “I think you saw that against Walsall and against Luton. “I think we’re managing games a lot better, especially when it gets to those scrappy periods in games. “There are always going to be periods in games when the opposition are on top. Wright is relishing life under new boss Grant McCann after cementing his starting spot at the heart of the defence alongside club captain Andy Butler. “The manager’s given me a lot of responsibility and he’s put a lot of trust in me,” said Wright. “He’s happy for me to defend one v one. “It fills you with confidence when a manager says ‘just go and do your job and you don’t need an extra person there, you’re good enough to do it by yourself’. “That’s a positive and it’s filled me with confidence. For me it’s about trying to put that into a game. “It’s a joy to play in this team to be honest, the way we play,” he added. Bradford arrive at the Keepmoat Stadium on the back of four successive defeats but Wright insists Rovers will not taking the Bantams lightly. “They’re a good team. We have no doubts about that,” he said. “I’m quite surprised to see them where they are at the moment. They’ve got some quality players, especially going forward.